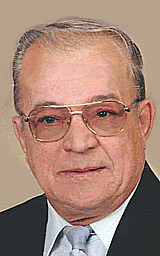 SLEEPY EYE — Leon C. Brey, age 78, of Sleepy Eye died on Jan. 31, 2019, at Sleepy Eye Care Center. Visitation will be on Monday from 9 to 11 a.m. at the North Entrance of St. Mary’s Catholic Church. Service will be held at St. Mary’s Catholic Church, Sleepy Eye, on Monday, Feb. 4, at 11 a.m. The clergy will be Msgr. Eugene Lozinski. Interment will be in St. Mary’s Catholic Cemetery in Sleepy Eye. Military Honors by the Sleepy Eye Honor Guard. Memorials are preferred to the Cancer Society or Alzheimer’s Research. Leon Charles Brey, son of Alfred and Agnes (Gleisner) Brey was born on April 14, 1940 in rural New Ulm, where he attended country school and New Ulm Public School. Leon served in the National Guard from 1958 to 1965. Leon married Dorothy (Gilman) Brey on May 9, 1961 and started their family. Leon had many jobs over the years. Hauling bulk milk, selling feed, OTR trucking and bar owner were just a few. Leon’s real love however, was farming and working in the fields. He loved to do custom field work for area farmers. You could usually find him in a tractor or combine where he liked to listen to the rosary on a local radio station. Leon enjoyed listening and dancing to old time music, annual fishing excursions with his buddies and watching his favorite tv sitcoms like Sanford & Son and All in The Family. Leon, age 78, passed away on Jan. 31, 2019 at the Sleepy Eye Care Center where he had been cared for by a very compassionate and caring staff during his final years. Leon is survived by his wife of 57 years, Dorothy Brey of Sleepy Eye; daughter, LuAnn (John) Haas of Sleepy Eye, sons Butch (Nancy) Brey of St. Peter; Larry (Janet) Brey of Mint Hill, NC; Lance (Shannon) Brey of Raymond; 9 grandchildren; brother Hilarian (Diane) Brey of New Ulm; sister Mary Krebs of Hutchinson; many nieces and nephews. He was preceded in death by his parents, son Lonnie Brey and brother-in-law Larry Krebs.